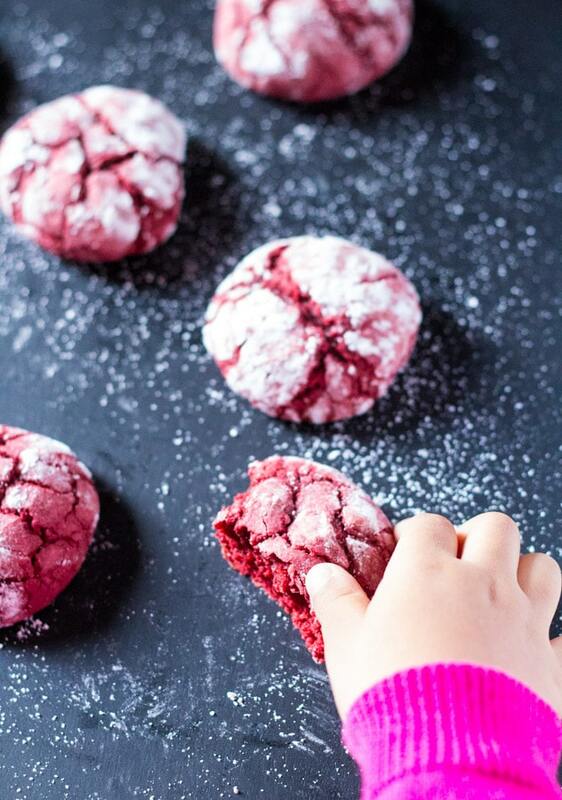 Red Velvet Crinkle Cookies are a delicious and easy treat that’s made from red velvet cake mix cookies, and it’s perfect for the festive season and Valentine’s day! Or any other occasion for that matter, you just need to love red velvet. 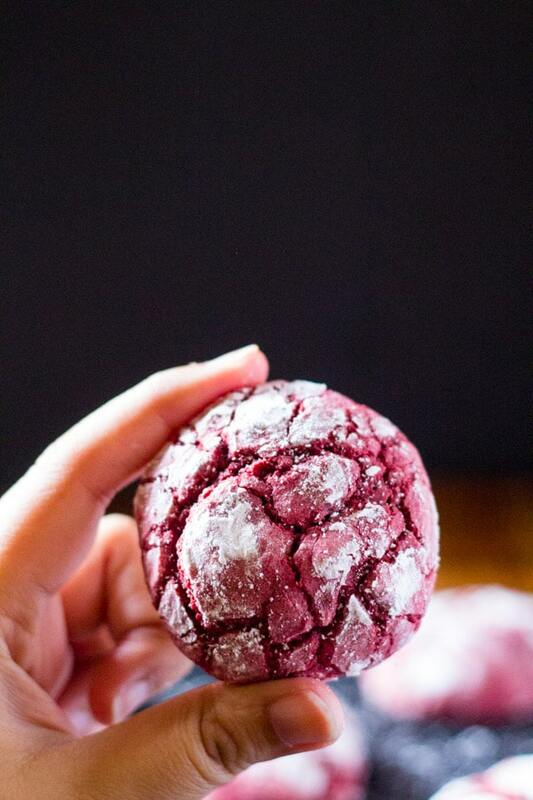 These Red Velvet Crinkle Cookies are just so pretty and delicious, I think they might be just my favorite kind of cookies! I actually love making cookies from cake mix, so if you’re looking for more flavors of cake mix cookies don’t forget to check out my Brownie Mix Cookies, Chewy Strawberry Cake Mix Cookies, and for a spooky treat you must try these Six-Ingredient Cake Mix Halloween Monster Cookies. So the internet is flooded with all kinds of crinkle cookies…and I don’t think my recipe is like life changing or anything. 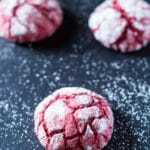 But these cookies are SO easy, SO pretty and SO tasty and for the very minimal effort required to make these red velvet crinkle cookies, that these cookies are TOTALLY worth it. Okay, the grammar is way off in this sentence right? Lol. Do I sound like a cookie monster to you, yet? Lol. 19 minutes. 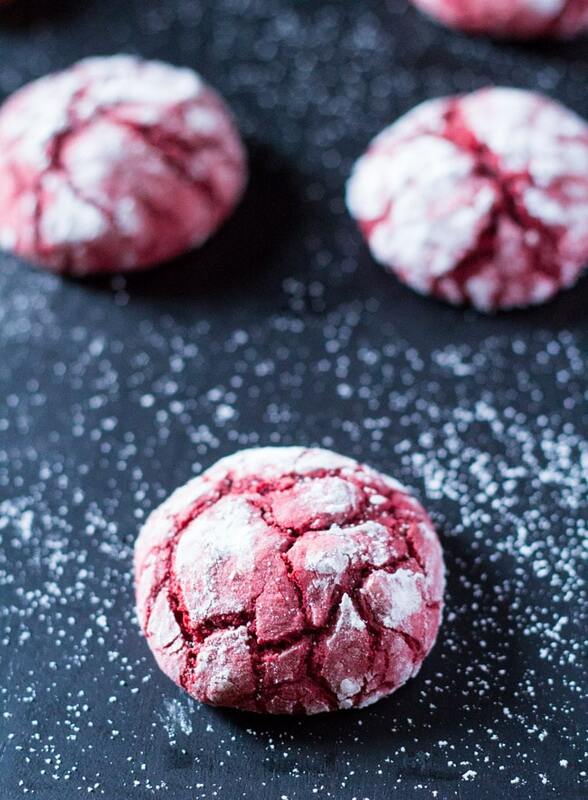 That’s all you need to make these Red Velvet Crinkle Cookies. 19 minutes to red velvet crinkle cookie heaven! Okay let’s have another moment of confession. I just couldn’t understand the internet’s obsession with crinkle cookies, especially those made with cake mixes. I mean why wouldn’t I just make a cake instead of cake like cookies? But then I made these red velvet crinkle cookies, and man oh man. These cookies really are something. 1.) I like to add a little bit of extra flour to the cookie dough for these red velvet crinkle cookies, because I feel it firms up the dough a bit more which makes it easier to shape the dough into cookie balls. Also, it helps reduce the amount of spreading of the cookies during baking. 2.) To form the cookie dough into balls, you can use a small scoop to shape the dough and then roll the cooke dough balls into the icing sugar mixture. Even a simple spoon works. The dough will be very soft to work with by the way, so don’t worry if you feel like it’s too soft and hard to shape. You can even stick it in the refrigerator for 15 minutes or so to firm up the dough. I didn’t do this though, and it was still fine. So chilling the dough is optional. 3.) Please do not over bake these cookies. I made the mistake of over baking the second batch I made and the cookies really hardened after coming out of the oven. And they weren’t yummy at all. 🙁 So even if they looked under baked in the at the 8-9 minute mark, take them out of the oven. As with all cookies, these cookies will also continue cooking on the baking sheet from the residual heat of the oven. These Red Velvet Crinkle Cookies are crispy on the outside, and chewy on the inside. And the flavor is just delicious! I thought the icing sugar would make the cookies too sweet, but it actually adds the perfect touch of sweetness. These cookies are super, duper easy. I mean even a baby could make these. Okay, maybe that’s not such a great idea. LOL. How Long Do These Red Velvet Crinkle Cookies Last? 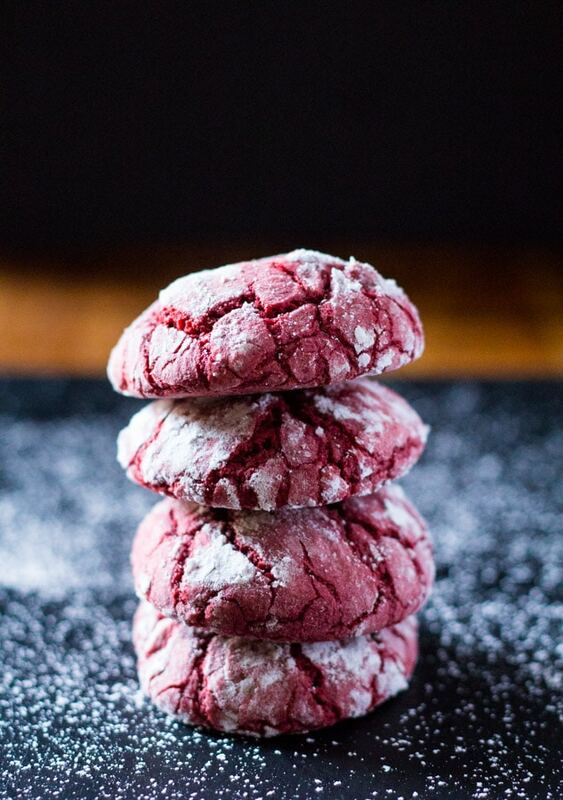 These Red Velvet Crinkle Cookies can easily be stored up to a week in an airtight container. 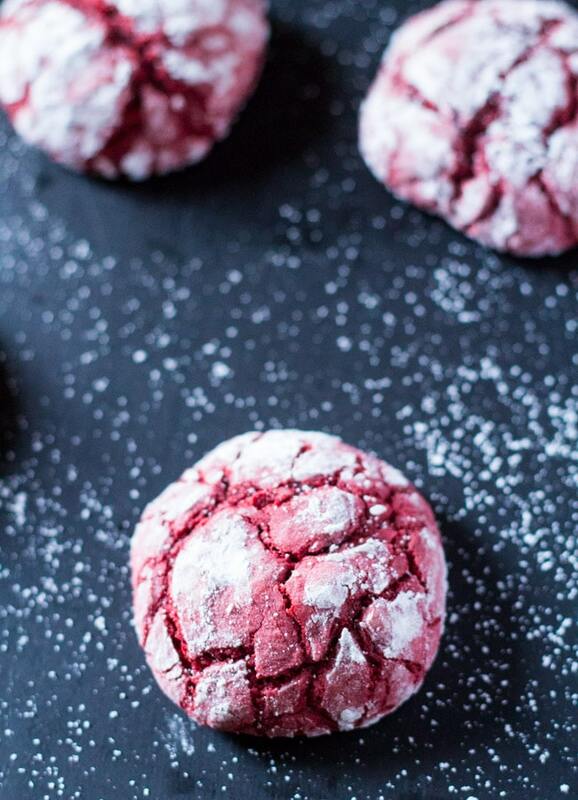 Can You Freeze These Red Velvet Crinkle Cookies? Then flash freeze them on a flat surface (such as a plate or tray or baking sheet). Once they’ve been flash frozen, transfer them to zip lock bags and freeze up to 1 month. When you want to have the cookies, thaw for 20 minutes or so, roll into the sugar and bake! These Red Velvet Crinkle Cookies are perfectly crispy on the outside but chewy on the inside. The perfect cookies for the holidays or even Valentine's Day! Preheat oven to 375 F. Prepare two baking sheets with parchment paper and set aside. Whisk together the red velvet cake mix and all purpose flour. Add in the eggs and melted butter. Mix with a wooden spoon until combined. You can also use a handheld electric mixer. In another small bowl whisk together the icing sugar and cornstarch. Shape the cookie dough into small 1 inch balls and then roll through the icing sugar mixture. You can use a small scoop to shape the cookie dough into balls or just simply use a spoon. Place the cookie balls 2 inches apart on the prepared baking sheets. Bake for 8 to 9 minutes. The cookies will look very undercooked with just the edges set, so take them out at 9 minutes because they will keep cooking from the residual heat of the baking sheet. Please do not over-bake these cookies because they will harden as they cool if baked for too long and will lose their lovely chewy texture. The cookies will also spread a bit during baking and that's completely normal. Let the cookies cool on the baking sheet for a few minutes before removing. Enjoy! These are beautiful! They also sound delicious… but I just can’t get over how pretty they are. Going to have to try this. Thank you for sharing! Thank you for sharing this recipe . They came out really great. I put Hershey Cookies and cream drops inside for a little surprise in the middle! best recipe ever ! I just have a question before I make these, how many does the recipe make? I’ve never made crinkle cookies before but I must try these! I love red velvet and think these will be perfect at Christmas time! Thanks so much for this recipe and the tips! I made them yesterday and they were a HIT!.